This light, easy-grip Magnetic Hair Brush has long fine magnetized bristles designed to massage your scalp to stimulate nerve endings and oil producing glands, for better, healthier, hair. Brushing your hair daily is just as important as a healthy diet and possibly more beneficial, than an expensive shampoo. Not that long ago 100 strokes of hair brushing was a daily ritual. And for very good reasons: regular hair brushing cleanses the scalp, improves blood flow, stimulates oil and hormone-producing glands along with many other health benefits. Start your own daily routine: Allow yourself a few minutes each day and enjoy the results. 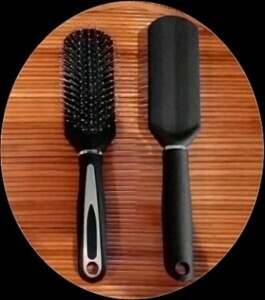 Brush dry hair only with a firm, slow, brush stroke. Bend forward at the waist and brush the underside forward then reverse the procedure. You will be surprised at the results and how good this feels. Magnetic Health Brush: 3950gauss strontium ferrite embedded magnet. Not that long ago brushing your hair was a daily ritual, never to be missed. And for very good reasons: regular brushing cleanses the scalp, stimulates blood flow for better circulation, stimulates oil and hormone producing glands, along with many other benefits. Start your own daily ritual: set aside a few minutes each day and enjoy the results. Brush your dry hair with a firm, slow, brush stroke. Standing is easier with long hair. Bend forward at the waist and brush the underside of your hair forward then stand upright and reverse the procedure. The long magnetic bristles will massage your scalp and stimulate the nerve endings for better, healthier hair. You will be surprised how good this feels! 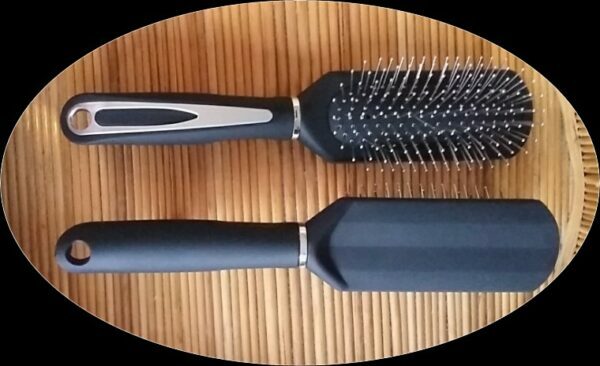 Magnetic Hair Brush: 3950gauss strontium ferrite embedded magnet.